Drawing II students tackled Cubism head-on and came out stronger because of it. 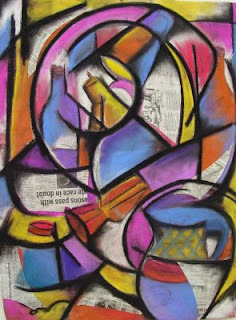 The work above by Maggie V. was one of several excellent interpretations of a simple still life of a lamp, a basket, some bottles, and other items. Check the slide show on the side panel for other students' works. It will be worth your while.